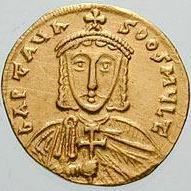 Artabasdos was a Byzantine general of Armenian descent who seized the throne from June 741 or 742 until November 743. His reign constitutes a usurpation against Constantine V, who had retained control of several themes in Asia Minor. The inevitable clash came in May 743, when Artabasdus led the offensive against Constantine but was defeated. Later the same year Constantine defeated Niketas, and on November 2, 743 Artabasdus' reign came to an end as Constantine V entered Constantinople and apprehended his rival. Artabasdus and his sons were publicly blinded and relegated to the monastery of Chora on the outskirts of Constantinople. The date of his death is unknown.